NewsWatch is a challenging, fun, casual, and professional work environment that will push you to succeed and achieve your career goals. We’ve been a leader in our field for over 20 years and strive to find innovative and dynamic solutions through our employee base. We work to foster an entrepreneurial spirit, a dynamic work environment, and a challenging atmosphere to help all of our employees reach their full potential. 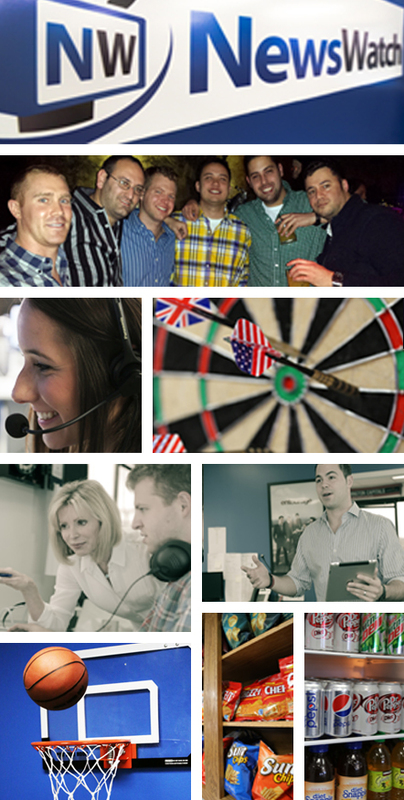 From dart boards and basketball hoops in the office, company outings, incentive trips around the world, and fun team building events; we’ve built a team that feels more like a family than a business. This spirit comes directly from our CEO and is fostered throughout the rest of the organization. We are committed to teamwork and open communication to allow all individuals to reach their personal and professional goals. Our workspace is inviting, fun, and functional. Fill out the Contact form below or email us at Careers@NewsWatchTV.com to see how you can start building your career with NewsWatch!